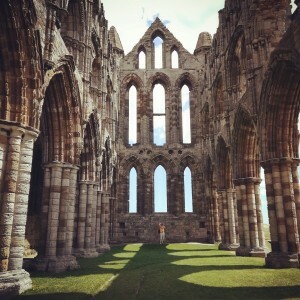 Prompt: Since we're just ending our Yorkshire holiday, I'd love something set around Whitby Abbey (I took the photo a few days ago while my youngest was trying to send me insane), preferably Illya centric, sweet or angsty, slash, any rating. “Oh, my head.” Napoleon retreated to the shadows cast by the abbey’s wall and closed his eyes. “By the wedding ring on her finger.” Illya sheltered behind a column to get out of the wind. “You should.” Napoleon pulled his camera from around his neck and walked away, obviously intent upon some shots. “That is a case of national pride. Illya snorted and walked a short distance to take a photo of the ruins from the inside. Once hundreds of loyal followers gathered here. Now it was just grass, wind, and the occasional tourist. They were seemingly the only ones left at the site at the moment, the cold October wind sending the less hardy scurrying for the warmth of a fire and tankard of ale. Illya walked to one of the window frames and looked out to the ocean. The wind was stirring up white caps and there was a promise of precipitation in the air. As chilly as it was, it could easily be snow. Once the sun set, the temperatures would drop fast. He turned back and glanced around. His gut twisted, but he immediately squashed the sense of unease. THRUSH had no idea they were here. They weren’t even on assignment and their trip to Whitby had been a spur of the moment decision. “Help me!” He heard the cry, Napoleon’s voice, and yet, not. “Napoleon?” He started to run in its direction, tripping over clumps of grass as he did. He slammed to a stop at the sight of Napoleon, cowering against a stone wall of the ruins. “Napoleon what are you playing at?” He reached out and grabbed his partner’s shoulder, jumping at the scream that followed. “Sir Geoffrey?” Napoleon’s voice was gentle and full of hope. “Oh, you must, you must.” Napoleon, nee Constance, looked around furtively. “I’ve heard them talk. I’ve heard them plot. They are saying I must be punished.” Illya nearly jumped out of his skin as Napoleon raced to embrace him. Napoleon pushed Illya away and Illya tumbled over a hunk of rubble. He fell, twisting to roll at the last minute, his abrupt stop knocking the wind from him. Napoleon shrieked and took off at a dead run, disappearing into the shadows for the ruins. For a moment, Illya’s vision blurred, as if he was looking through a veil of water. He tried to call out, but he had nothing to work with. Gasping, he finally managed to pull in the air his lungs cried out for and, gasping, managed to crawl to his knees, desperate to follow after Napoleon. He dragged his arm over his eyes to help clear his vision. Just then he saw something falling towards him and twisted away. The chunk of masonry dug into the ground as it landed. “Turn around, you silly girl,” Illya said gently and Napoleon spun. “I did.” Illya returned the kiss and then something changed, shifting slightly and Illya pulled away to look into his partner’s hazel eyes. “Not that I’m complaining, but is there something going on that I should know about?” It was Napoleon’s voice, strong and edged with humor. “That would be a feat.” Napoleon sipped his whiskey, a smile on his lips as the liquor warmed his stomach, although he still shivered. “Still cold?” Illya was working on his second tankard of local ale. A young barmaid placed a tray on the table between them. Napoleon smiled at her, automatically flirting with her. She blushed and busied herself with the tray, uncovering and setting plates before them. “Can you tell me about Constance de Beverley?” Napoleon asked. “Okay, that was weird.” Napoleon finished his shot and held up his glass for a refill. “That was what you called yourself this afternoon. I have a feeling that, scoundrel that you are, you helped to free that young lady.” Illya reached for the malt vinegar. “Thanks.” Illya smirked and proceeded to eat his fry. Illya mulled it over, looked up at the ceiling as the wind howled and shook the small inn and shook his head slowly. “I don’t think that I would, Constance…” And just for an instance, it was as if the wind paused and sighed… but that would just have been silly.